25 08 2015 - Micro-Box A.I.O NEW (All In One) V3.0.1.0 - NEW MODELS ADDED for FREE by IMEI: FIRST IN THE WORLD ! POSSIBILITY TO BUY 1 YEAR FULL activation with ONLY 20 CREDIT! POSSIBILITY TO BUY 1 YEAR SUPPORT with ONLY 5 CREDIT! DONT FORGET OUR LAST NEWS : 3rd BOX support : HXC - MAGMA - INFINITY - SLBOX ! Now use Micro-BOX on it ! 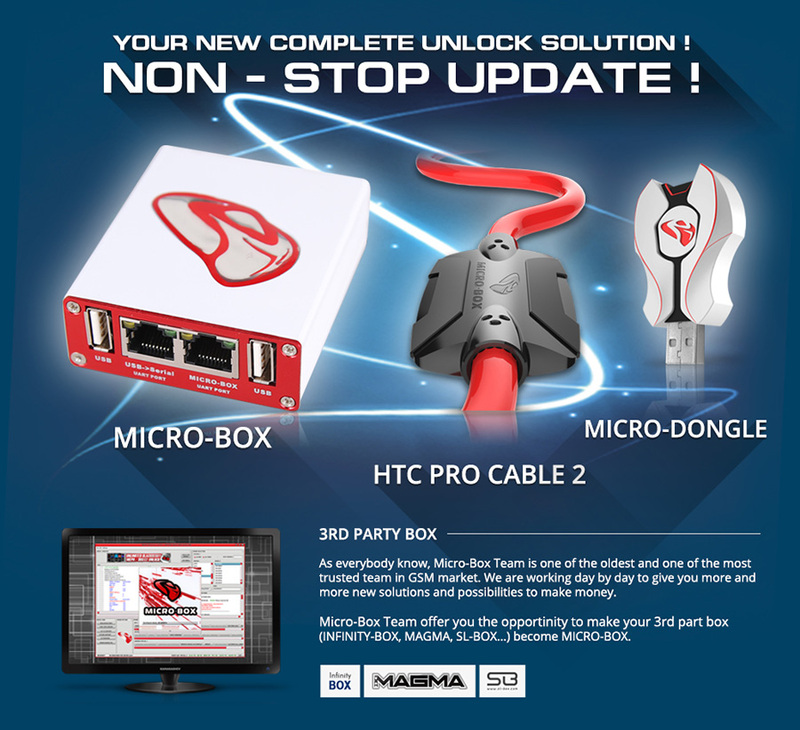 Follow us on Web 3.0 : MICRO BOX V3.0 THE BEST MULTI PLATFORM UNLOCKING TOOL ! it's a small small update!!!!!!!!!! where is samsung update !!!!!!! where is huawey y series update!!!!!!!! Please take our last update''. ??? Tis box is @ end of life ??? hohoho !!! i use this box for a long time , and it's always so good !!! microbox with all new samsung without activation pack = free ! Instead of write No sense post Ceck first or buy Right module lol...all supported these model but is clear that if you want all for FREE w/o active any A.I.O (all in one) must need of purchase single activaction....Option of ALL IN ONE Team released from time..